The British Carnatic Choir, a pioneering concept aimed at uniting diverse communities through music, will be officially launched this Friday (June 12). The concept is the brainchild of Dr Chithra Ramakrishnan, pictured, Artistic Director of Shruthi UK, a not-for-profit Midlands-based arts & culture organisation. The launch event, which will take place in Birmingham, will be inaugurated by world renowned musician and scholar Chitravina N Ravikiran, hailed as the Mozart of Indian music. It will also feature a panel discussion. 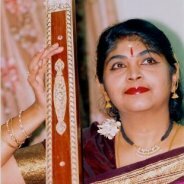 The British Carnatic Choir aims to identify and recognise people, particularly children and young adults, of all abilities to create a British Carnatic Community, one which reflects the multicultural mosaic of Great Britain. Full story next week.